HTTP is the protocol that powers the Web,and is the most common protocol on the Internet. Because http is a request/response protocol a visitor viewing a web page must issue a new request in order to refresh the data. For most websites this isn’t a problem as the page content is static, but there are a class of sites were the information being displayed is changing, and for which http may not be the best way to deliver it. Data for Live flight arrivals is displayed on a web page and is updated on a regular basis (every 60 seconds is common). When the webpage is updated usually the entire contents of the page is sent regardless of the changes. This isn’t a problem with a single client but for 100s or thousands of connected clients this would cause significant server load. The solution using MQTT is to connect a single http client to the web server as before. 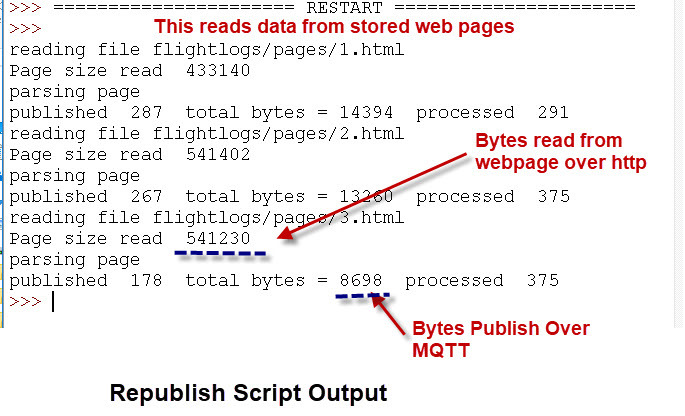 The web page is downloaded, processed, and the data for each flight is extracted. The data is then sent over MQTT with each flight having its own topic, and only changed data is sent. 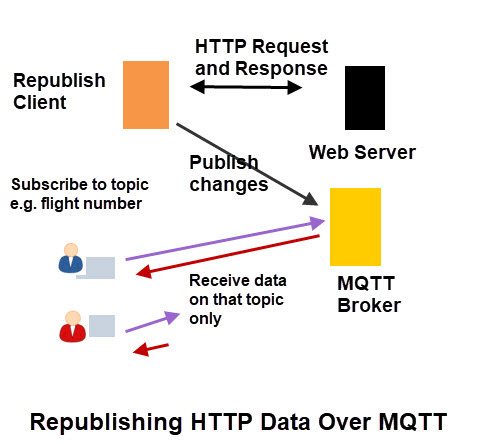 An MQTT subscriber could subscribe to the flight that it wanted information for rather than seeing the data for all flights. This should result in a considerable reduction in website and network traffic. This is a demo script written in Python that reads data from a web page processes the data and republishes the data over MQTT. The example I will be using is flight arrival information published by a local airport. Because the script needs to parse the HTML of the web page provided by the airport I have created test data from the one I used which can be used instead of live data from the website. This means that you safely run the script without affected the actual website. Note: This is the Recommended option. Here is a video showing the script usage. I am interested the gauge the popularity of such a script so that I can decide to develop it further from its current draft state. Could you please complete the short survey below and I would be grateful for any comments. Does this script Interest you?